Our friend and neighbor Cindy passed away on Memorial day after a courageous battle with breast cancer. She was 51 years old. She loved a good party and lived her life to the fullest. On June 1st we celebrated her life. I was one of the lucky people in a large group who got to know her. She will be missed by all her friends and family. 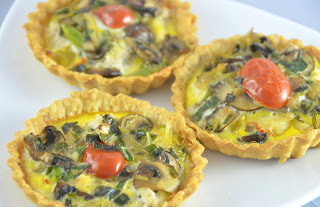 I made these quiche-pies for the party and people seemed to enjoy them. I think Cindy would have approved these colorful appetizers! 1) Heat oil in a medium size pan over medium high heat. Once the pan is hot add onion and garlic chives, sauté about 1-2 minutes. 2) Add the mushrooms grape tomatoes, sauté about 2 minutes. 3) Stir in salt and pepper and turn off heat. Set the pan aside. 4) Heat the oven at 450 degrees F.
5) Gently unroll the crust and cut to the size of your quiche mold. Place the crust in ungreased mold. Press the crust firmly against the side and bottom. 6) Prick the side and bottom with a fork. Continue the process for all the crusts. Take the scrap dough and knead into a ball. Use a rolling pin and roll it out and continue the process until all the molds are covered with a crust. Bake for 10 minutes or until light brown. 7) Remove from the oven and let cool before filling. Turn oven down to 350 degrees F.
8) Whisk the duck eggs gently in a medium size bowl until blended. 9) Place the lobster meat on the bottom, add the garlic chives and mushrooms mixture, pour the egg mixture on top. May add goat cheese if desired. 10) Bake the quiches at 350 degrees F for about 20 minutes or until the egg mixture is just cooked. Remove them from the oven. Once cooled remove the quiches from the molds. *Initially I added the lobster meat on top of the quiches but I noticed that the lobster meat gets a bit dried out during the cooking process. 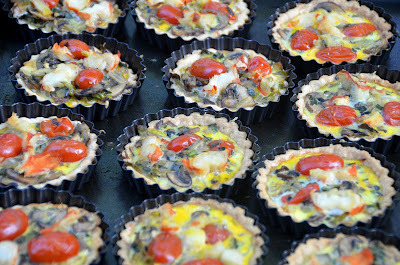 I have only 12 mini quiche molds so I made 2 batches. It worked out well since I learned that I can hide the lobster meat on the bottom of the quiches. For the second batch I had a little shark meat left over so I chopped it up and added it to a few quiches. The combination of shark and lobster meat came out surprisingly tasty! *You can make these quiches the day before. Once they are completely cooled refrigerate them. You may reheat them in the oven at 300 degrees F for about 15-20 minutes or until they are warm. *The duck eggs came from Cracked an Egg Farm in Barrington, NH and the garlic chives came from Meadow's Mirth Farm in Stratham, NH.